Kindness in its essence is a trait sometimes undervalued and often forgotten. Yet a few words carefully selected, or simply left unspoken can mean the difference between a smile and a tear. We speak of intention, of gratitude and karma, but a simple act of selfless kindness is all it can take to brighten or soften the days of at least two people. It is present in babies when they are born, no child comes into this world with a preconceived idea of malice or hatred, we arrive with the capacity to love unconditionally, yet slowly that capability becomes ground down and chipped away over the years. In some minds, the potential for love, charity or altruism becomes crystallised, growing in new forms, in others a sort of calcification takes place, a smooth, hardened shell presents itself to the world. I might like to add here, that I do not write this from some rose-tinted cloud of kindness and empathy. I write this from my kitchen table, where I am slumped. I dragged myself here across the carpet because today I had a panic attack and I had to leave work. I have felt the rumblings of one for the past week or so, but some loose-lipped words this morning sent me over the edge, and as I lay on my bed in that hazy aftermath where you feel completely empty and a little bit numb. I decided that the best thing to do was something constructive with this feeling (I also had to stop the day from feeling wasted). To draw us back to my favourite analogy, life on a boat actually offers up a wonderful platform for kindness. To be at sea grants us a condensed version of the outside world, yes it is archaic and often patriarchal, but it relies on wanting to keep one another alive. We depend on one another, knowing that the task ahead would be so much harder if not impossible alone. That self-reliant entity that is your ship, allows you to shed the skin of daily life, removing all other roles and responsibilities aside from sailing, eating, sleeping and how you will progress from A to B. Each change of direction is predetermined by a greater force, you cannot fight the wind, you can only harness it in order to move forward. Maybe this applies to our emotions, to anger or frustration? Bottling them up inside will rarely relinquish them, you may only harness that energy in order to move forward. Then there are the consequences of careless harsh words in an environment fuelled by broken sleeping patterns and constant movement. Not only are those words magnified but there is no easy exit, you are with those people for better or for worse, so please let's be kind. These words are easy to write, the thoughts are easy to form. The hard part is in the heat of the moment when you are distracted or angry. I do not claim that it is possible to constantly check yourself for thoughts of anger. The freedom to express our thoughts, ideas and emotions in any way that we like is a human luxury, we must try only not to exploit it. If you are granted words, please use them kindly. If you are granted authority, please use it wisely. Those of you who know me well, will know that I love nothing more than being at sea. I did not join the yachting industry to sit on a dock sipping piña coladas, ( however delicious they may be!) I took up a career in sailing so that I could go sailing. It's not always easy, sometimes is bloody hard, it hurts, its cold, wet, dark and scary. This voyage from Newport RI to St Thomas, in the US Virgin Islands, was all of those things at different points, but thats just it isn't it! Only at points! 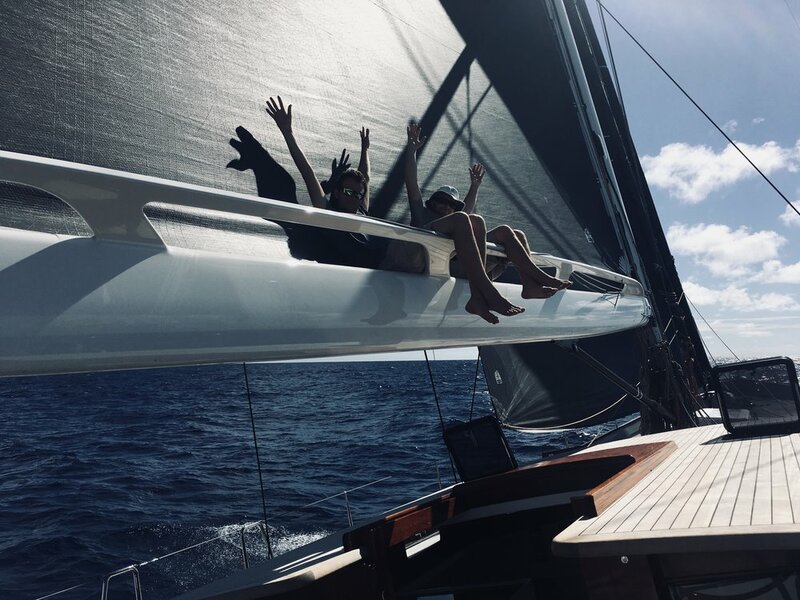 It was, as it always is, outweighed by laughter, sunrises, fast sailing and a sense of "we are all in this together-ness" that I am yet to find is any other pastime. I am sure I have written about the magical "take off" moment previously, when you kill the engine and feel the hull power up underneath you, when the boat starts to heel and dig a trench in the water behind it. The power and empowerment felt in this moment for me is immeasurable, as with each surge forward, your horizon seems a little closer. It is this feeling I would like to give to more people, I would like families from cities, from war zones, from land locked countries, to feel what it is like to know a land with no borders. Because to be a citizen of the ocean is to know this feeling, to be at home in the sea, where all lands are connected is a freedom we are all entitled to and should have the right to experience. Toroa ~ In all her sunshine glory on passage from Brooklin to Newport RI. It has to be said that the latter part of 2017, saw my creative practice almost totally abandoned, in favour of the build, launch and commission of a 72ft sailing vessel with luxury interior. The project has been a joyful rollercoaster and one that I have truly relished. The images below show a glimpse into the type of work involved, I am unable to share too much given that the boat is privately owned, however, I have been pleasantly surprised by the amount of satisfaction I have felt upon its completion. To watch and aid in the transformation of a pile of raw materials into floating vessel, which works, moves sails, flies even has been nothing short of amazing. To feel the structure you have nurtured fill with the power of the wind for the first time and take off is a miraculous feeling and I am so grateful to everybody that has put time and effort into turning "Toroa" into the boat she is today. You can see more of her here. If you have any questions about working on boats, sailing or what it is like to work on a new build, please do not hesitate to get in touch! Just comment below or send a message to studio@stella-marina.co.uk ! This vagrant living has come at a good time for me, I had become settled in my practice at home. Begun once agin to establish a formula for making work, something which only ever leads to boredom and monotony. I have enjoyed the challenge, and have not been short on inspiration! The challenges of the frozen temperatures design new and exciting ways of mark making. The transient moments captured here in paint form traces or ghosts if you like, of a totally atmospheric experience. The faster the ice forms, the more magnificent the swirling patterns. -25 C is cold and zero humidity is cold enough to turn boiling water straight into clouds! The immediate transformation from liquid to vapour is indicitive of the extreme conditions. So the new home is not so bad! The reality of moving home is slowly settling as the snow starts to melt..... America really is a very beautiful country. Maine is not somewhere I had ever really considered visiting, let alone living, isn't curious the curving roads our lives end up taking.